Using a heavy rain situation in Barbados, this video will demonstrate the use of Multi-hazard, Impacts-based Forecast and Warning Services. The demonstration will show an evolution of the forecast in the 3-, 2-, and 1-day lead time periods. The rainfall case is based loosely on 2018's Tropical Storm Kirk, although the name and specific details of the storm are not used. 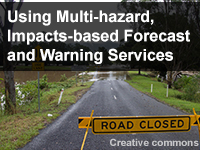 Describe the benefits of using the Multi-hazard, Impacts-based Forecast and Warning Services. Explain how the impacts matrix is used in the forecast process. Recall how the impacts-based warning approach is used for a specific weather hazard.